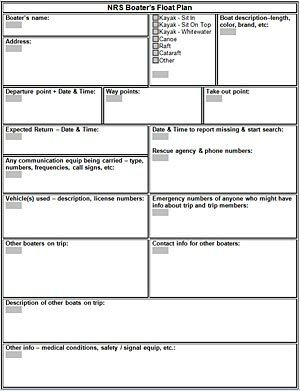 Here is a convenient Boater’s Trip Plan form PDF. Always let at least one person know where you’re going boating and when you plan to return. Then, if something unforeseen happens, and you don’t make it back as planned, search and rescue personnel can be notified and know where to start looking for you. Providing as much information as you possibly can will really help in the event of a search operation. Be sure to add contact information for the search and rescue agencies most likely to be able to respond to a search request. These include the Coast Guard, Forest Service, Park Service, local law enforcement, sheriff’s posse, etc. Do your homework in determining what agency should be notified; don’t leave it to the people you’ve left your Trip Plan with to figure that out. Click on this image to view the full form.